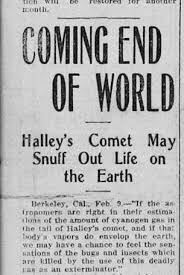 Many people spent the first few months of 1910 resignedly waiting to die along with the rest of humanity when Haley’s comet returned from its 76 year journey through the universe.The comet had been here many times before and astronomers knew much about the comet, in 1910 a bit too much. 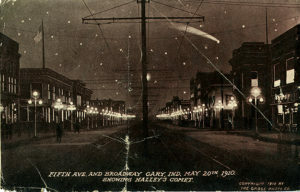 Since the comet’s last visit the science of spectroscopy had developed and astronomers viewing the approaching comet discovered that the comet was not only coming very close to earth in 1910 but the comet’s tail, through which the earth would pass, contained deadly cyanogen gas. French astronomer Camille Flammarion believed the the gas “would impregnate the atmosphere and possibly snuff out all life on the planet”. Needless to say some of the more gullible abetted by the yellow press, con artists and religious fanatics panicked and prepared to die even though the reputable scientific community tried to reassure the populace that nothing of the sort was even remotely possible. 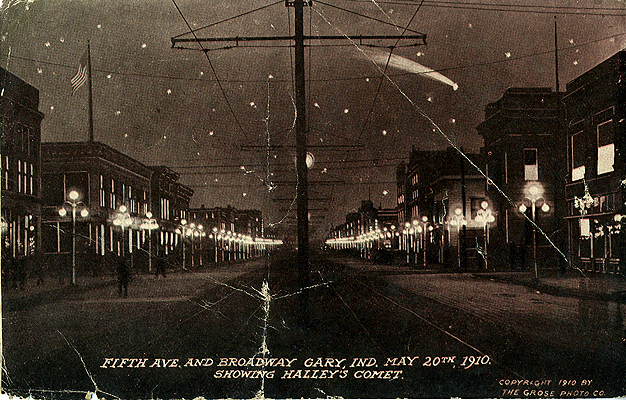 “During the night of May 18/19 of 1910, when the Earth passed through the tail of comet Halley, some people took precautions by sealing the chimneys, windows, and doors of their houses. Others confessed to crimes they had committed because they did not expect to survive the night, and a few panic-stricken people actually committed suicide. 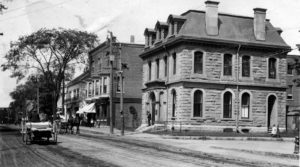 Enterprising merchants sold comet pills and oxygen bottles, church services were held for overflow crowds, and people in the countryside took to their storm shelters. 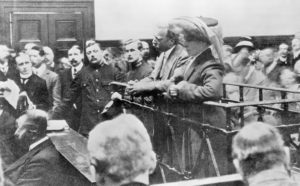 A strangely frivolous mood caused thousands of people to gather in restaurants, coffee houses, parks, and on the rooftops of apartment buildings to await their doom in the company of fellow humans.” The other big international story of 1910 was the Hawley Crippen murder trial in London. Crippen was an American doctor living in London with his wife Cora. After a dinner party at their home on January 31, 1910 Cora disappeared and another woman, the lovely Ethel Neave took her place in the doctor’s home. When questioned he gave several contradictory explanations for his wife’s disappearance, finally settling on the claim she had run away with her lover to the United States. Scotland Yard got involved but could find nothing to suggest foul play and were prepared to drop the case when Crippen and Ethel fled to Paris and took a boat for New York, Ethel disguised as a boy. Suspicious again, the police searched the house and found the torso of a human body buried the basement and while it was not positively identified as Cora, Crippen was met at the dock in New York, arrested and in a sensational trial in London tried for her murder. He can be seen in the dock at the Old Bailey in the photo above along with Neave who was charged as an accessory. He was found guilty and hanged, Neave was soon released. The case has been the subject of many films and books, many proclaiming Crippen’s innocence. As late as 2007 DNA evidence found the body in the basement to be someone other than that of Cora. 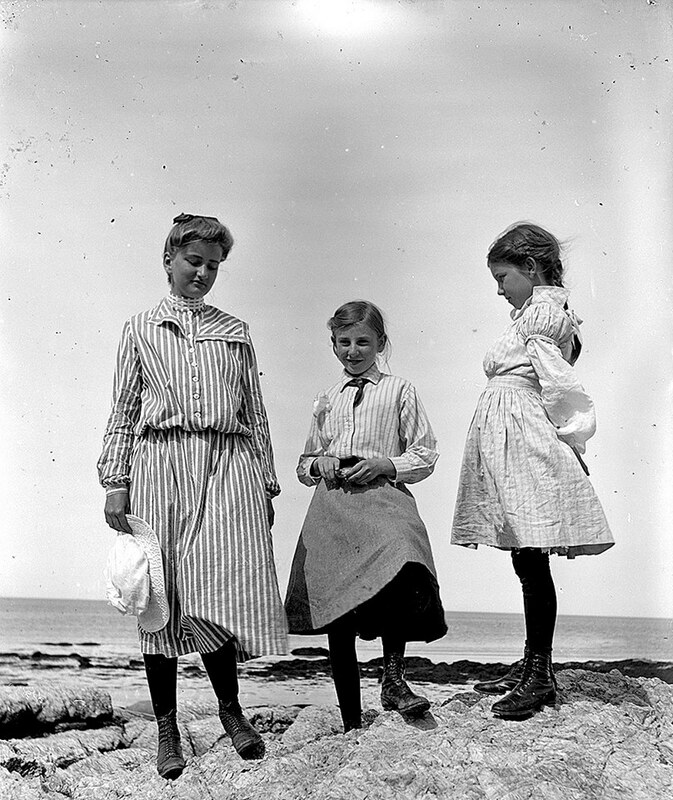 In the United States in 1910 even if the comet didn’t get you there was always typhoid, especially if you lived anywhere near a Irish lady named Mary Mallon. Mary was what was unknown at the time, a healthy carrier of Salmonella typhi- typhoid. 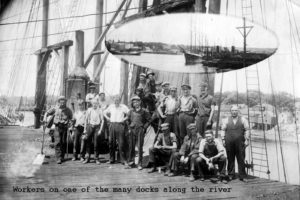 After several outbreaks in New York in the early 1900’s a sanitary engineer named George Sober began an investigation which led him to believe that Mary, although healthy, was a carrier of the disease. She had been the cook in several of the homes where the disease originated. Mary however refused to cooperate with the investigation and only after the authorities forced her to be tested was it discovered she carried the disease. She was quarantined above in a typhoid ward for a couple of years but eventually released in 1910 on the promise she would no longer serve as domestic. 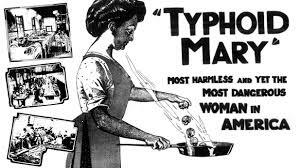 Soon thereafter a typhoid epidemic occurred in a local hospital and it was discovered the cook, Mary Brown, was none other than Mary Mallon, by then known as Typhoid Mary. 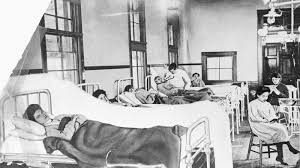 She spent her remaining years living in a secluded cottage under the watchful eyes of the authorities but not before infecting over 3000 people with typhoid. In other U.S. news 1910 saw the hiring of the first female police offer by the Los Angeles PD, the Boy Scouts were incorporated and a avalanche buried three railroad passenger cars in the Cascades killing 118 people. 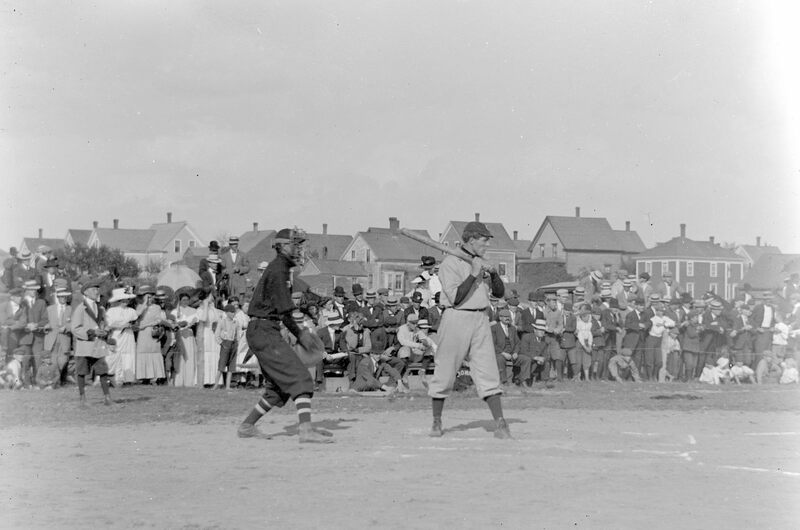 In sports President Taft threw out the first ball to start a tradtition and the baseball season, Cy Young won his 500th game and Nap Lajoie nearly won the batting crown from Ty Cobb on the last day of the season when his opponent’s third baseman played back on the outfield grass for both games of a doubleheader allowing the speedy Lajoie eight bunt singles. The hated Cobb still won the batting title. 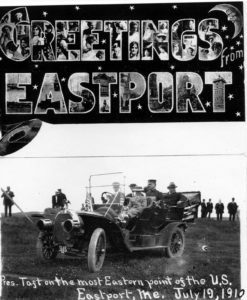 President Taft visited Eastport in 1910 and acclaimed the friendship between the United States and Canada as a wonderful example of international cooperation. 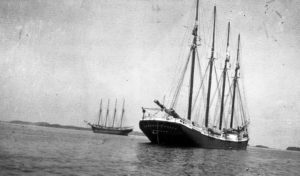 He also created a stir by seemingly supporting Easport’s claim to be the most easterly place in the United States, a claim which was, and is, disputed by Lubec. In Robbinston the Congregational Church, established in 1809 burned to the ground after lightning struck the steeple. The fire did not spread quickly but lack of fire equipment or even a long ladder prevented the townsfolk from putting the fire out. 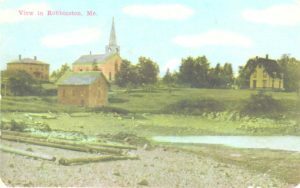 A new church was built and remains on the site to this day.The yellow home to the right is now the Redclyffe Hotel and Restaurant. 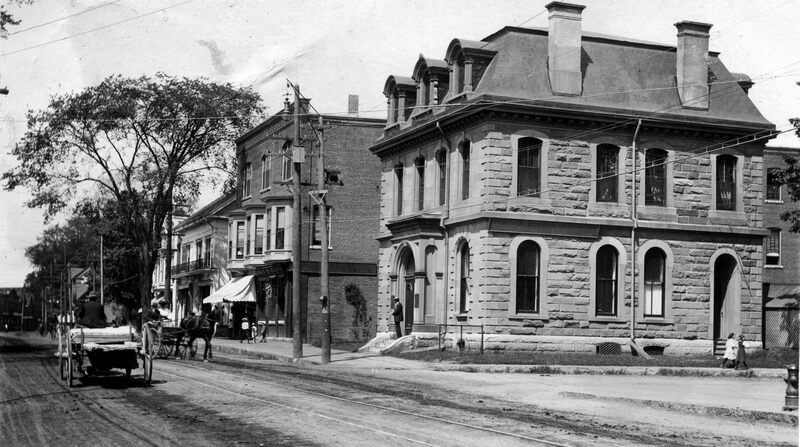 The bank building is still on Water Street and later became the Royal Bank On the sidewalk in front of the then defunct bank the Hurdy Gurdy man plays for Carmen and R Whidden Ganong, far left during the summer of 1910. In Calais and St Stephen the populace stayed warm with coal in 1910. 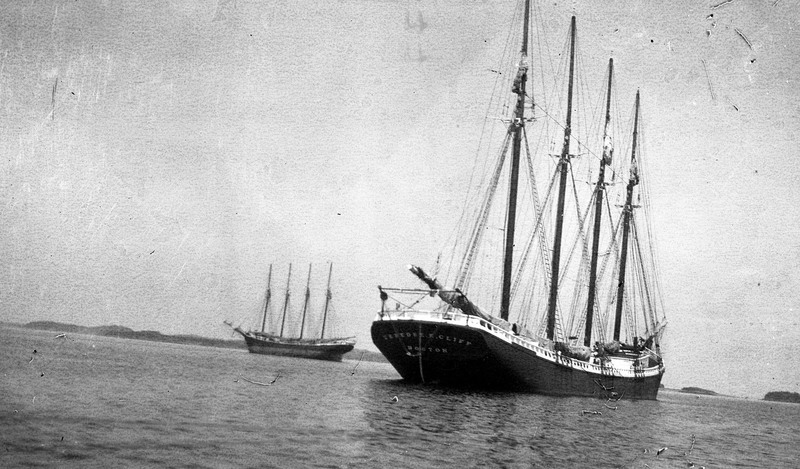 Huge coastal schooners were built to carry the coal which was unloaded at the coal wharf in back of what was the Heritage Center.In the bottom photo the old Post Office is in the center between the masts of the schooner. 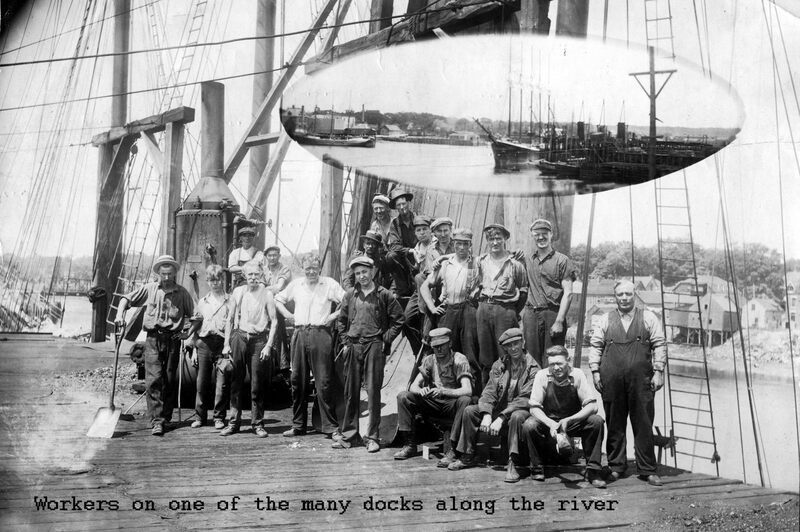 The center photo shows a typical crew which would be hired for the unloading of a coal ship. Life on the sea was still a risky business in 1910. 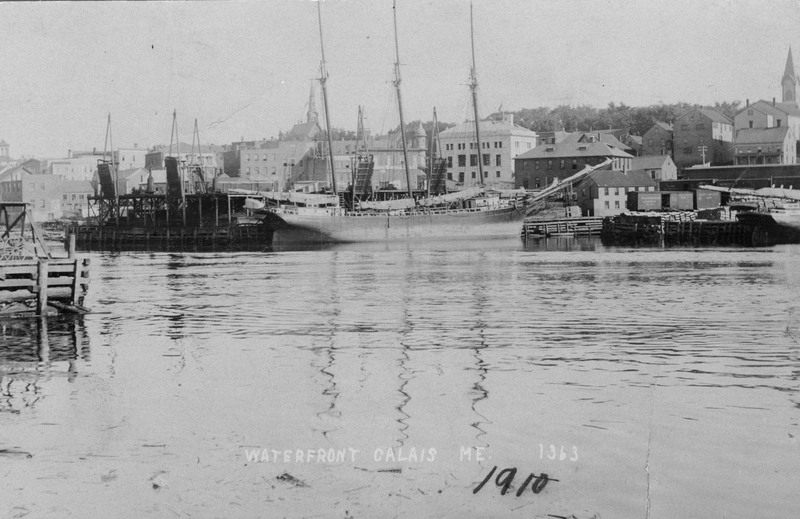 The George Prescott with a largely Calais crew went down off Gloucester Massachusetts in February 1910 with no survivors and only a couple of months earlier the steam ship Hestia went down off Grand Manan with a loss of 35 crew. 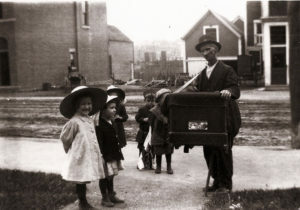 Other local news Calais in 1910 shows how tragedy and accidental death was a fact of life 100 years ago.Little Ellen Brovard 5 years of age was fatally burned when her clothes caught fire after brushing against the stove at her home on Downes Street. Young Wilford Vining of Cooper died from exposure after getting lost. He had gone to the post office with his father who had allowed him to stay behind to watch some men working on the road. Probably getting cold he had tried to find his way home and wandered nearly 10 miles before he laid down from exhaustion on a cold April night. He was found days later in a ravine huddled between two large rocks. In Woodland Hayward Walls, 6, fell into the Mill Pond and drown as did Francis Sweeney 5 who fell into the river at Milltown. 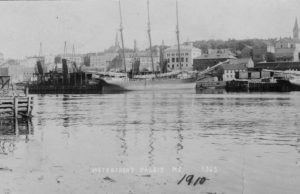 Two seamen William Dwelley and John Stuart fell into the river in Calais and drown, John after a night on the town in St Stephen’s taverns. In a miraculous escape after partaking of too much demon rum Ed Lawless of Milltown Maine decided to take a nap at the Salmon Falls railroad yard. Having no pillow he used the rail of the tracks to rest his head. 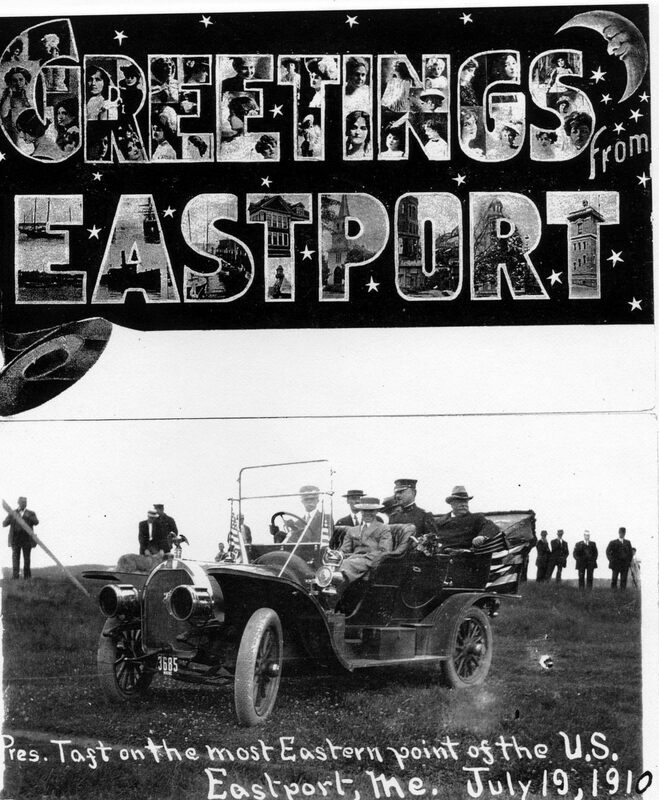 According the Advertiser ” While he was resting in the arms of Morpheus a shifting engine came along and but for sharp lookout of the driver, Lawless’ sleep would have lasted an eternity.” He suffered only a gash in his head but “His hat, which fell off, was cut in twain”. 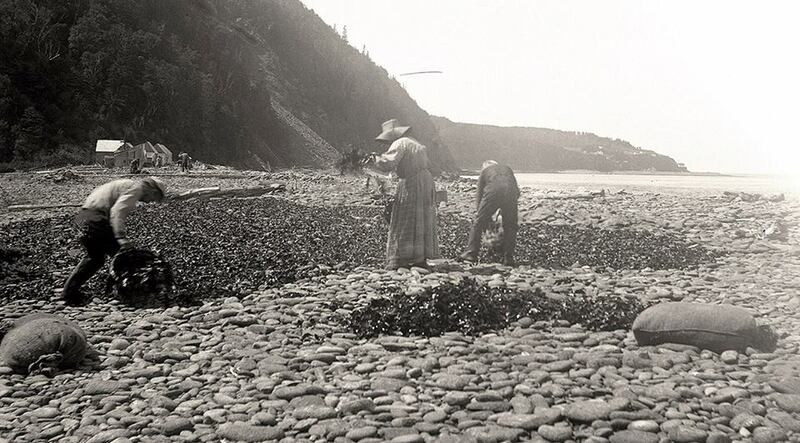 We’ll end on a more positive note with a couple of 1910 photos from Grand Manan. The first just a nice photo of three young ladies and the second the gathering of dulse, an occupation which continues on Grand Manan to this day.